Designed by tool makers with a John Deere collection, this tool is a must for every John Deere owner as described below. It is very effective, inexpensive and can be used again and again. The tool consists of an L-shaped steel die that is machined to the original shape of the factory hood. A body hammer is used to re-form the hood nose into the die. Once you complete a section, move the die and repeat the process. Also serves as a gauge that lets you know when the shape is right. Made from 1 thick steel and measures 4 long x 3 wide x 1 deep. 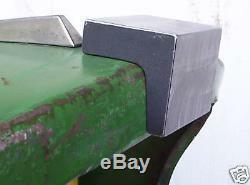 The item "John Deere Hood Tool 4020 4010 4000 3020 3010" is in sale since Saturday, December 8, 2018. This item is in the category "Business & Industrial\Heavy Equipment, Parts & Attachments\Heavy Equipment Parts & Accessories\Antique & Vintage Equipment Parts". The seller is "tools4deeres" and is located in Faribault, Minnesota. This item can be shipped to North, South, or Latin America, all countries in Europe, Australia.